I bought the 6X6 size in the 50 pack. Works great and very convenient, worth every penny. Thank you for your review. I’m delighted that you love the convenience of Strutwipe. So I finally have used them enough to get a decent review. Initially my plane was down for a few months getting a new panel and avionics work, then a week after it was done, I sent it for complete interior redo, After picking the plane up the struts were filthy dirty. I used my 6×6 wipe and it cleaned all 3 struts and the tube on the steering dampener. They seem very strong and do a good job of cleaning. Because the struts were so dirty, I couldn’t get another use out of the initial one I used, so after flying several times afterwards, I usually wipe my struts down after every flight. I seem to be able to clean all 3 struts and dampener approximately 3 – 4 times with a 6×6 wipe until its dry or too dirty to continue. Overall a well made product. No more pouring 5606 on a rag or paper towel. I keep a few in the plane and the rest in the hangar. I have liked them so much, I gave several out to my neighbor hangars for them to try as well. Good job on creating a useful product. After my initial purchase of 50 gets depleted, I will definitely be ordering more. Thanks Again! Thank you for your review. At 3-4 flight per wipe that will give you about 200 flight. That’s about $0.25 per use. That’s not bad value from money! Cupp’s Industrial Supply, Inc in Tucson, AZ distributes this product & our customers love it! Strutwipe is easy to work with and always on time with deliveries. Great company and a great product, look forward to working together more in the future. Cupp’s Industrial Supply, Inc handles all clients that either do not or cannot use PayPal. Because we have such an awesome relationship, shipping time is not affected. Mike can be reached at Mike@CuppsInd.com for all your Strutwipe needs! 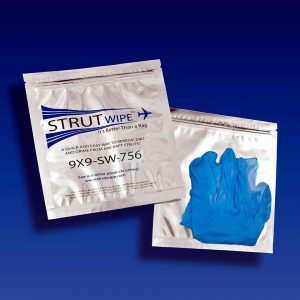 I’ve never cleaned my struts before, but after using Strutwipe I will do so on a regular basis. Your product worked great! We are looking forward to being a service to you again. Old Cherokee I bought 21/2 years ago. Struts were”sticky”, and I suspected bad Orings or air/oil servicing.. My mechanic would clean and lube whenever I got to see him, as I refuse to deal w/home field FBO. 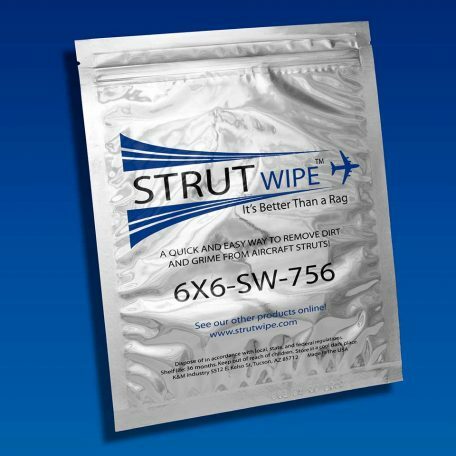 Upon using Strut Wipes often, there is a great improvement in landing gear. Even my “frequent flyer” buddy notices the difference. Thanks for great product. Thank you for your review. 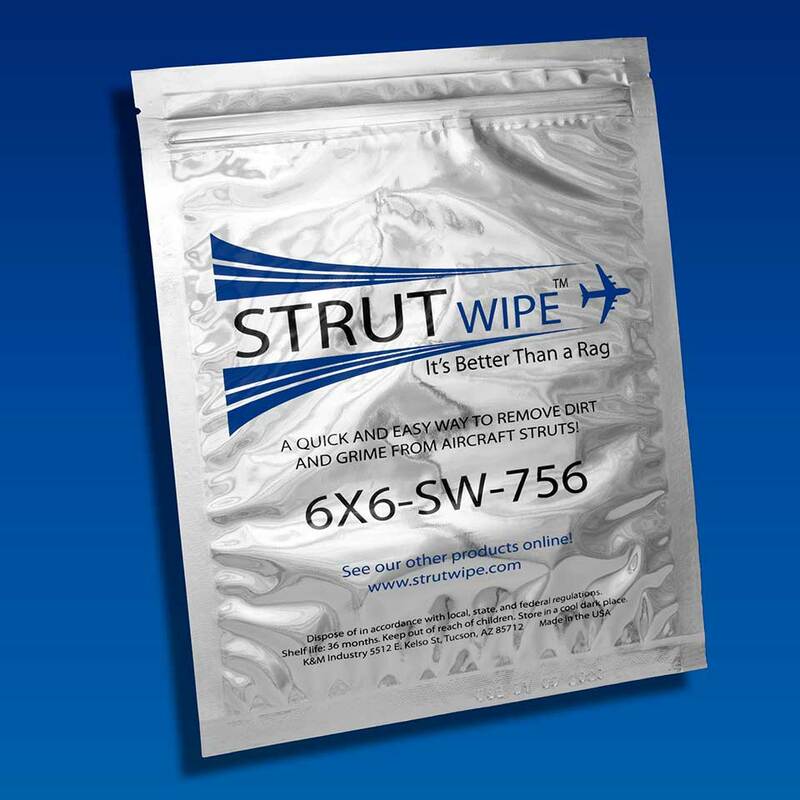 Nothing delights me more than hear a fellow aviator satisfied with Strutwipe.